When bookseller Franlee Frank acquired the late composer David Diamond's book collection about two years ago, she joked it would have been easier to buy the whole house rather than move all the books. Diamond's dark green, shuttered dwelling on Edgerton Street bore the weight of thousands of volumes and manuscripts. The Library of Congress absorbed the composer's important original papers. Another dealer bought a few, select volumes. That left Frank to cart away the mere eight or nine thousand left. Since then, she's been selling them at her bookstore (Greenwood Books, 123 East Avenue,325-2050) boxfuls at a time. 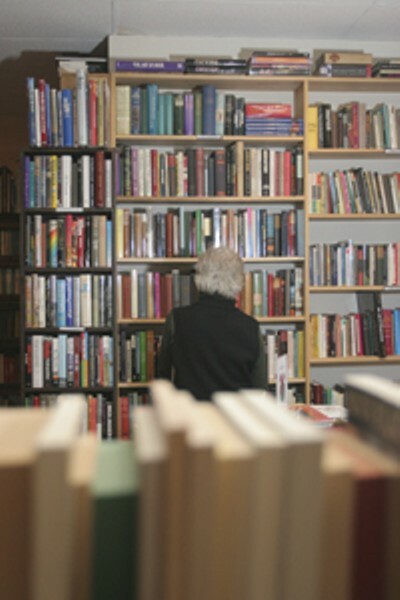 They cover a wide range of topics, but most of them are about music, its performers, structure, history, and criticism. Prices vary from a few dollars to hundreds. Curious Eastman professors, staff, and students stop in regularly to check out the latest additions. They know it may take years to see them all, since there are thousands left, still packed away. Frank says Diamond used his books: he handled them, wrote in them, and even glued stuff between the pages. Some contain authors' inscriptions. Many are signed or embossed with the composer's distinctive block letter stamp, "DAVID DIAMOND," and some are crammed with notes, asterisks, and terse observations. He wasn't careful with the objects the way a collector would be. But their new owners will reap the rewards, since they offer a glimpse into the mind of a man who was, until his death this past summer, one of Rochester's truly formidable intellectuals. She could be Mayor-elect Bob Duffy's trump card. At a press conference last week, Duffy announced that Patricia Malgieri, the former CEO of the Center for Governmental Research, will be his deputy mayor. She'll be the first woman to hold the post in Rochester. Duffy's been taking some heat for some of his staff changes, but the Malgieri selection was a hit. In announcing the appointment, Duffy commented that "very few people have the institutional memory that Patti Malgieri has," perhaps a response to critics who say he is removing too many senior city administrators too quickly. The "institutional memory" was developed outside of City Hall, of course, but in her role at CGR, Malgieri has studied key area institutions, including the Rochester school district, and she has been both an analyst and a consultant on economic development. A bright, experienced administrator, as deputy mayor Malgieri will be a powerful force in city government. She'll also be in an interesting position. In her work at CGR, she has been critical of Rochester school district operations. In her new job, she'll be reporting to a mayor who was sympathetic to the district during the campaign --- and who won the endorsement of the teachers union. In other Duffy news: on Monday, the mayor-elect announced the termination of three more long-time city officials: Director of Communications Bridgette Burch White, Neighborhood Empowerment Team Director Rodric Cox-Cooper, and Parks, Recreation, and Human Services Commissioner Loretta Scott. While White and Cox-Cooper began with the Johnson administration 12 years ago, Scott's work with the city dates to the 1970s. The Canandaigua VA Medical Center has finally gotten what it needed --- a solid reason for keeping its doors open. After several years of under-funding mental health services, the Veterans Affairs Department is increasing its spending to address the higher-than-anticipated number of vets returning from Iraq with mental health problems, including post-traumatic stress disorder. And the Canandaigua site has been designated as one of three treatment centers that will specialize in mental-health care. The VA has committed $3 billion to its mental health services budget for 2006, an increase of more than $1.6 billion over 2005. How much of it will go to the treatment centers is unclear. The Canandaigua site still has to go through the VA's asset realignment process and provide a comprehensive use plan. Administrators in Canandaigua have until June 2006 to present a detailed proposal for programs, facilities needs, staffing, and budget. The VA is basing the new mental health care units on an approach it uses to treat spinal cord injuries, says a spokesperson for New York Representative Jim Walsh. Patients are directed to three VA facilities that focus on orthopedic and neurological medicine. "The number of veterans needing mental health services has been increasing across the board," says the Walsh spokesperson, "but there wasn't a strategy in place. We're going to be testing the same kind of model, and Canandaigua was seen as the perfect setting. It already has a reputation for its work in mental health." It'll be at least a year before the Canandaigua veterans center can offer the new services, says the Walsh spokesperson. It'll take that long to convert the site for its new mission.